This is a summarized, web version of the report. To protect client privacy, there are several details of this investigation that are left out or cannot be discussed here. For the same reason, portions of the included audio artifacts may be "bleeped" and some of our evidence cannot be included on this site at all. For portions of this investigation I used a Spirit Box (sometimes referred to as a "ghost box" or "Frank's Box") which uses a somewhat controversial technique called "radio sweep". Along with standard EVP, radio sweep falls under the category of ITC or Instrumental TransCommunication. I remain openly skeptic about many radio sweep responses and evidence and therefore I do not make claims that any of the spirit box responses in this report are solid paranormal evidence. Tascam DR-07 Digital Audio Recorder: Stationary audio placed in the basement weight room. Sony ICD-PX720 Digital Voice Recorder: Stationary audio placed in master bedroom. Sony ICD-PX820 Digital Voice Recorder: Used for arrival, tour, setup, and accompanied Patrick throughout the investigation. Channel 1 (Wired Infrared Camera): Master bedroom near bathroom, facing closet. Channel 2 (Wired Infrared Camera): Upper floor hallway near stairs, facing master bedroom. Channel 3 (Wireless 1 Infrared Camera): Basement, placed between steps and washer/dryer, facing laundry area. Channel 4 (Wireless 2 Infrared Camera): Weight room facing bench and corner near mirror. Sony DCR-TRV280 Handycam Camcorder w/NightShot: Accompanied Patrick through the investigation. Sony HDR-CX150 Handycam Camcorder: Stationary Video in second bedroom, facing closet. Before I even entered the home I had my Sony PX-820 digital audio recorder going (started recording at 9:01pm). I kept it with me for the tour of the house, and then once I started setting up equipment I kept it on the dining room table (which was being used as our base). Basement - Just feelings, nothing else. But they mentioned feeling like they have a permanent visitor down there. 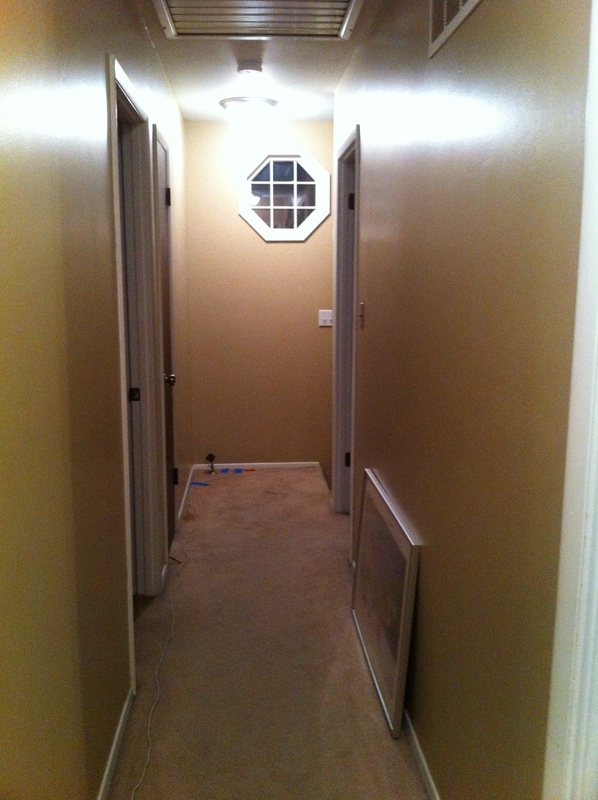 Room next to dining room – Homeowner has occasional feelings and often thinks they’ve seen something out of the corner of their eye. They mentioned something about little lights. Stairs going to bedrooms – Occasional footsteps heard. Master bedroom – Many feelings and experiences involve the closet. The homeowner’s closet backs to another family member’s closet (this closet has its own paranormal experiences) and shares a wall. Other experiences (many happening overnight) include the bed moving, name being whispered, seeing shadows, sleep paralysis symptoms, visions, etc. Last experience in the house was the previous Monday in the master bedroom. Homeowner experienced feelings and sensations. Before that it was the footsteps on the stairs a few weeks earlier. Hallway/Stairs – There was an experience two family members recalled involving kids voices out in the hall. Purchased by the homeowner in 2000. Previous owners were an older couple. The husband passed away in the hospital and the home was later sold. Homeowner feels there may be a connection with a “Steve” and the house. At 10:07pm I was in the process of setting up. The recorder was still sitting on the dining room table. Two of the family members were near me and one was helping me prepare to take some DVR cameras down to the basement. I had just asked them about the availability of outlets in the basement before this EVP was captured. In my opinion, this EVP clearly says “See Dorothy”. During setup the TV was playing lightly in the background and was a few rooms away. Most of the time I could clearly identify what came from the TV and what didn’t. However, I can’t be absolutely sure what the following audio clips are. I can’t really rule out the TV, and other than the first example, I can’t make out a message. Once again, the recorder is on the dining room table. At 10:25pm we are all in the dining room discussing where we’d like to place another camera. A family member and I had just agreed that the upstairs hallways would be a good idea. Immediately after I say “I thought about that as soon as I went upstairs” and Marilyn saying “yeah” it sounds as if a voice says “Terrible”. Then right before the end of the clip before I start talking it seems to possibly try again and maybe say the same thing again, but I cut the voice off when I started speaking again. I’m not incredibly confident on declaring these paranormal. At 10:51pm I believe the homeowner is alone in the dining room keeping an eye on the DVR and is preparing to help me adjust the shots via a radio. I’m upstairs. 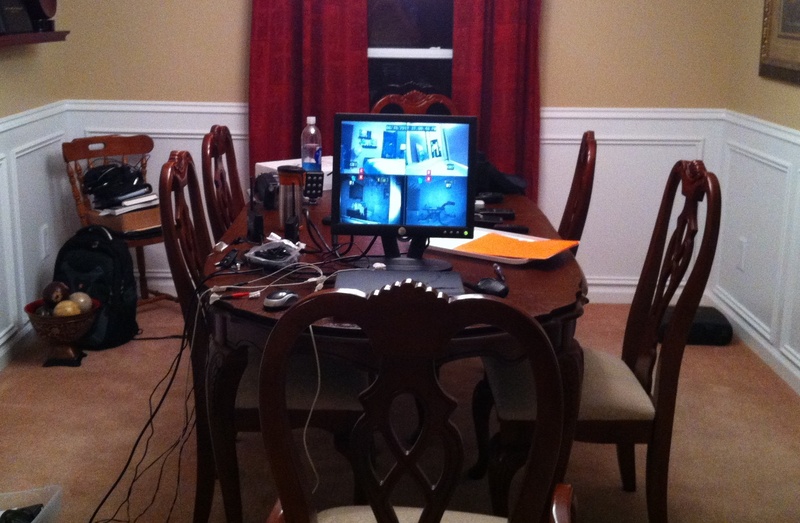 Once again the audio recorder is still on the dining room table. There are two places where there seems to be words or a phrase whispered lightly. Is it possible that another family member was also in the room and whispered something? Also, this is a good example of being able to hear the TV lightly in the background. This next one could be somewhat controversial and was captured at about 10:59pm. I initially sent this clip to the homeowner with the impression that it was someone communicating “Can you help me?” followed by a whisper. During the time it was recorded, the homeowner and I are in the living room next to the dining room taping camera cords and discussing a recent investigation. The audio recorder is still on the dining room table. I’ve since listened deeper to this EVP and enhanced it a bit. What I came up with is something that I am excited and yet embarrassed to share with you. I’ve never captured a “dirty” EVP such as this, and it is a far cry from “Can you help me.” After listening deeper and enhancing, it is possible that what is said is “Can you _ me” immediately followed by a whisper saying “Don’t say that.” The message can certainly be debated. I’m convinced the first voice cannot be the TV, but I can’t rule out the possibility of the softer whisper coming from the TV in the family room. At 11:55pm I start recording on the DVR. At 12:40am Marilyn leaves the second bedroom after a meditation. At 12:53am I went upstairs to take some photos and document some base readings. At approximately 1:01am the stationary digital audio recorder from the Master Bedroom captured what sounds like a door shutting from somewhere in the house. After viewing the footage from this time in the DVR, it is unclear what caused the sound. We officially began our investigation in the second bedroom at 1:12am. 1:14am I asked “Is there anyone here with us right now?” I can hear a possible “yes” that was captured in the stationary digital audio recorder from the Master Bedroom. Compared to the audio from the second bedroom, nothing is picked up from that exact moment. At 1:16am we decided to attempt communication with the Spirit Box. I asked if anyone was present with us. There are a few possible responses of “hey” but then I also hear what could be a quick “hello”. After I asked if I heard them correctly, it sounds like there is a “yeah”. At 1:17am the homeowner points out that they heard “Charlie” after I asked for a name. Through the stationary camcorder video it seems a bit stronger and I think I hear it twice. Just seconds later there is an interesting response with 3 syllables. “We’re working” ?? Not sure. Then in the Stationary Camcorder Video I hear “Patrick” after asking them to repeat my name. At 1:18am in the Stationary Camcorder Video, it sounds like “test it” right after Marilyn suggests if maybe we should put the box in the closet. Less than a minute later after asking “Can you tell me your name?” I hear 3 possible responses, including “Go home”. At 1:20am – I hear 3 possible responses, including “Go Away”. At 1:21am I introduce myself and ask for names again. Again, there seems to be several responses that are hard to hear. The homeowner heard “Michael”. I didn’t hear it at the time but now I can pick it out in the video for sure. Maybe even a few times. I also hear what may be “Charlie” again… but it is clearer in the audio. Although, when I slow the “Charlie” response down it sounds like “hurry”. Maybe it’s not a response at all. Also, I believe somewhere in this clip is where Marilyn heard “Marlin Jenkins” or “Marlin Jankins”. At one point during analysis I thought I heard it. Now I can’t find it. 1:23am – I ask for them to say the word “spirit”. The homeowner and Marilyn both claimed to hear it. I don’t hear it clearly. I do, however, hear “witchcraft”. 1:24am –Possible “pizza” after I ask for them to say it. In the audio you can hear a really fast “pizza” right after I ask, but a lower sounding voice seems to say it later and is clearer in the video. Less than a minute later. Not sure what is being said, but lots of activity after “What do you think about us being here with you?” And then again after I say “Hello” and ask for them to introduce themselves. Possibly a “hello” back and maybe a “Paul”? Seconds later I asked Marilyn what some of the names were that she picked up earlier in her meditation in the second bedroom. She remembers “Agnes Beardsley” and “Sue Crowley”. I asked about the names and didn’t hear any significant responses. At one point I asked if they knew what year it was. I can’t pick anything out, but Marilyn said she may have gotten the year of ’57 or ’58 earlier in her meditation. 1:27am – Interesting response after I asked about how many people were with us. Possibly “What do you think?” or “Let me think.” ?? Marilyn hears “6”. After many times of hearing it I also hear “We’re pissed”. Not sure. A few seconds later I hear a possible “Agnes” after asking for names again. Right before I turned the Spirit Box off Marilyn thinks she hears “There are 6 people here.” I didn’t hear it at the moment but I do now, and maybe even more than one. Also, there are several “six” responses. At 1:33am the stationary audio recorder from the weight room in the basement captures a possible muffled voice. Obviously we’re up in the second bedroom at this time. I’ve matched the times and I can’t find anything from our own conversation or voices that would sound like this or be loud enough for it to be picked up in the basement. There’s always a chance it could have been something going on outside. 1:34am – The noise in the hall that Marilyn heard. She described it as a “step.” She said “I’m seeing them get off downstairs. They’re not coming up here. And then I felt something come around the steps.” It is important to note that another family member was staying in a room right next door during the investigation. These steps were not captured in the stationary digital audio recorder located in the Master Bedroom. Also, nothing is captured in the DVR footage. At 1:38am a possible voice was captured in the stationary digital audio recorder located in the Master Bedroom. This is right before you hear me ask “What about your family? Do you have a family?” From audio and video footage from the second bedroom, I don’t hear anything that would cause this sound. Just a few seconds later, still 1:38am, a thud is captured in the audio. No one acknowledges hearing it, but seconds later I asked if anyone was feeling anything. Marilyn mentioned she was seeing that the “elevator” won’t go up here. They seem to all be in the basement staying away from us. She mentioned that she keeps hearing the steps. I mentioned that I heard a few creaks. 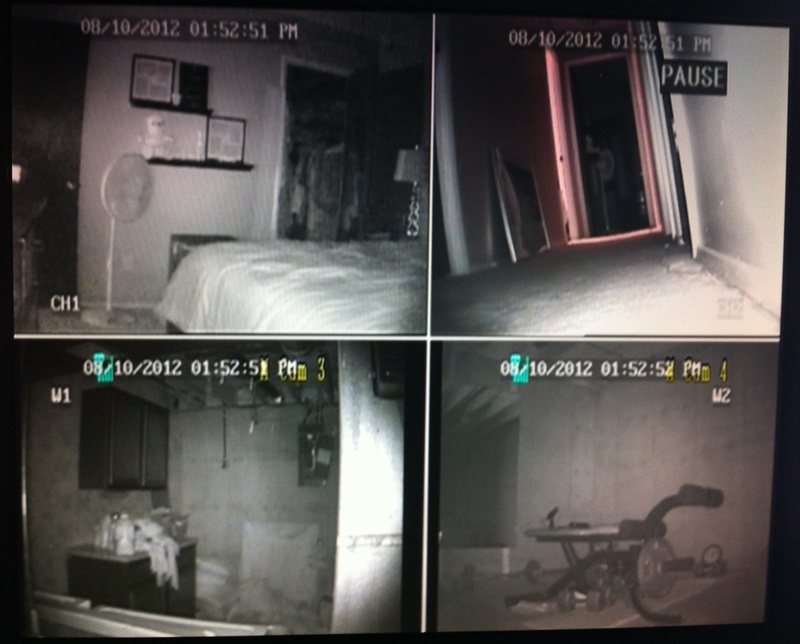 We again have to keep in mind that another family member was staying in the bedroom next door during the investigation. Here is the thud from the audio in second bedroom with us. And here is the same moment from the stationary digital audio recorder from the Master Bedroom (placed on the night stand next to the closet). I was in the doorway of the closet and the homeowner and Marilyn were sitting on the bed. Marilyn asked me if I could tell a difference in the energy in the closet and how my head felt (because she mentioned there being a lot of pressure in the closet). I mentioned that I could hear that the air just came on because I could feel a draft. Regarding my head, I mentioned that earlier during the spirit box session I felt some heavy pressure or light headedness in my head while I was leaning up against the door frame. The homeowner reported a temperature from the Mel Meter of 70 degrees in the bedroom and 71 in the closet. At 1:40am there is a pretty loud pop captured in the stationary digital audio recorder located in the Master Bedroom (placed on the night stand next to the closet). It sounds pretty close to the recorder. Again, we have to remember that another family member was staying in the third bedroom down the hall. And now the same moment from the recorder with us in the second bedroom. It happens in between our talking (right about the time I say the word “gradual”) and is tougher to hear. No one acknowledged it in the audio. At some point Marilyn entered the closet. At around 1:44am she got feelings of having a sore hip or a “hip/joint problem”. Less than a minute later, Marilyn says “The air is lighter. The pressure’s not there.” She feels the presence of a very timid older lady-the same older lady from earlier. Marilyn was picking up feelings of being timid and scared. At 1:45am Marilyn mentioned being cold and we all agreed to feeling a little chilly. Using the Mel Meter, the homeowner reported that the temperature was reading around 72 degrees (up to 72.4) (that’s 1 to 2 degrees higher than the last check). They also noted that the air conditioning was off at the moment. At 1:47am there is a higher pitched light whistle sound that is picked up from both camcorders in the room. Not sure where it is coming from. Just seconds later the homeowner takes some of the equipment into the closet. At 1:49am, just as Marilyn paused because she thought she saw someone’s head poke out of the closet, the audio recorder picked up what sounds like a very soft “yeah”. Looking at the video, it doesn’t look like it could possibly be Marilyn’s voice, plus it’s not picked up in the video. We left the bedroom and went downstairs to the dining room to talk at around 1:51am. At around 2:08am the homeowner, another family member, Marilyn, and I are in the kitchen talking. From the stationary digital audio recorder from the Master Bedroom you can hear some of our conversation off in the distance. But the clip below, from the Master Bedroom, seems to have 3 responses that are out of place and don’t sound like they belong. I can make out “help”, “hello?”, and then __?___. We headed to the basement at 2:17am. When we walked into the weight room, everyone pretty much acknowledged that they weren’t feeling much, at least not the pressure and energy that Marilyn experienced earlier in the evening. Not long after we make it to the laundry room, a family member decides to take the family dog up to the guest bedroom because she was wanting to join us. At 2:22am they make it to the upstairs hallway and enter the guest bedroom. The family member returns a few minutes later. Marilyn begins to talk about an energetic or magnetic “pull” she continues to feel in the room, along with pressure in her head. This was when she was near the weight bench side of the room. At 2:28am I asked for a knock or a noise to validate a presence. Several seconds later you can hear a clear but light tap, and then 8 seconds later another one. They both sound as if they were right on the audio recorder or camcorder (both in one of my hands). It also could have just been the handling of the audio recorder. It is clearly picked up in the video as well. No one acknowledged hearing it. At 2:32am the audio recorder captures a strange click or voice. It sounds EVP-like to me. It isn’t picked up in the camcorder video. It is picked up right after Marilyn says “Oh my head feels better here.” Only explanation I can think of is maybe it was the handling of the recorder. The homeowner was holding the recorder at this time. When I asked Marilyn if it was still feeling different than it felt earlier, she said “My head feels better here” (meaning in the center of the room, opposite of the corner with the weight bench and the mirror). Then she says “When I stand over there (corner by weight bench/mirror), the whole back of my head feels like it’s going to explode.” She said she didn’t know what it was. She later said “it literally starts pounding over here” as she walked back to that area. We talked about what kind of energy could cause that feeling. There was nothing in that part of the basement, electrical or otherwise, that was registering any kind of significant readings on any of my meters, other than a small EMF spike at the small electrical box (not sure what exactly it is) above the entry to the weight room. At around 2:43am in the stationary camcorder from the second bedroom, it sounds like there are two footsteps from somewhere. It is unclear if it is actually coming from the third bedroom (where other family members were staying). A family member and Marilyn both acknowledged that they didn’t feel a presence there at the moment. Normally the family would feel a presence in the basement. We eventually all have a seat in the middle of the weight room. At 2:47am we decide to start a Spirit Box session. 2:48am - After “Is there anyone with us right now?” Both family members and Marilyn all claim to hear a response of “yeah” or “yes”… Marilyn said she heard a female voice. There is a female sounding voice of at least 3 syllables. The frequencies or stations were moving way too fast for this same voice to get 3 syllables out. I can’t make it out. I hear several other spots that could be voices but nothing super clear. The clearest one I hear is what sounds like “yes” in a lower voice. There is another clear low voice that says “yes” right before I say “My name’s Patrick…” After listening several times I hear what could possibly be “We’re still here”. 2:49am – I hear “lights” after asking if they had any suggestions for how to be more successful with the equipment. 2:50am – I switch to FM Sweep and say “Are you still here with us?” I hear a possible “yes” immediately after my question. 2:50-2:51am – Marilyn thinks she heard “move on” and right before that she said she heard a pop… not sure if she was talking about in the room somewhere or coming from the Spirit Box. Before “move on” I can faintly pick out a possible “leave” a few times. 2:51am – I can hear possible short responses. I asked about who was telling us to “move on”. I asked “Was that you?” Could this be the response of “Please. Yes.” ?? 2:53am – I switch back to AM Sweep. 2:53am – I think this is what Marilyn heard as “circle us”. “Circle… (then in a different voice) us”. 2:54am – A family member first hears “Call for us.” (I initially kept hearing “help” and missing the “for us”.) This is after I ask “What do we need to do with a circle?” Marilyn gets chills. I then ask “How are we to call for you?” After I ask “Who should we call?” the same family member hears “everyone”. I can possibly hear it in 3 separated syllables (e – ‘vry – one). 2:54 – 2:55am – I hear “circle” again. No one claims to hear it in the recording. Later I ask “Can you tell us how many of you are here?” I hear a possible answer of “six”… but then in the audio I hear “many”. I ask “Are you asking for help?” There are several possible responses that I hear, but I also can pick out a possible “yes”. I ask “What do we need to do to help you?”. I hear a few responses in the same voice. Not sure what they’re saying. A family member claims to hear “ask me”. Seconds later the same family member hears “help us” again. I ask “How can we help you?” Marilyn then says she doesn’t feel good energy right now. I hear a few possible responses of “circle” again. A family member hears “three”. 2:58am - I hear several possible responses after I ask “What’s your name?” Possibly more “circle” responses. 3:00am – I stated that my head was kind of hurting. 3:00am – I claimed to hear “beautiful”. I heard it listening back as well. No one else claimed to hear it. 3:00am – I ask “Is there anything else you want to say?” and both family members hear “get out.” We all heard “get out” once or twice again. At 3:01am Marilyn shouts “Do YOU want to get out”? She then hears “Help us out”. Marilyn says she’s picking up two different energies-the energy of people and then something very negative. She felt like they were coercing us to get together in a circle so that they could call forth more and make it more powerful. Since we aren’t doing that she felt like they were losing interest in us. We later heard “yes”. 3:02am – I ask “Are there two groups here?” The homeowner thinks they heard “Get the hell out” and Marilyn mentions earlier she may have heard the “f word”. Both family members agreed. Marilyn said there are many… more than one. 3:03am - Marilyn hears “help us” again and says it’s the female… I can make out “help”. I ask “Are you requesting help?” Marilyn hears “yes”. I then ask “How can we help you?” I think I hear a “Hello?” I’m pretty sure a family member hears “see it” (Marilyn asked if they said “seal” or “seal it” and then asks if that is what they possible heard). I later hear “wait”. 3:04am - I ask “What would you like us to do?” and Marilyn and the homeowner hear a possible “f*^k” or “f*^k off”. At 3:12am Marilyn is talking to the family members about their intentions in cleansing the space. While they are speaking a strange noise is picked up in both recorders. I can’t figure out what it’s from. There is no video of this moment. Below is what it sounded like from two different recorders in the room. At 3:20am I return with a new tape and Marilyn and the family begins a meditation to Seal the portal. DVR stops and investigation ends at around 3:48am. Lunar phase on August 9th 2012 (Thursday) is Last Quarter.